For proof there is but one dependable authority, a sole historical record — the Bible. There were no eye-witnesses to the resurrection. Even so-called "apostolic fathers" had no source of information save that record which is today available to us — the biblical revelation. Any tradition, then, which conflicts with God's revelation must be dismissed. The doubting Pharisees were asking Jesus for a sign — supernatural evidence — in proof of His Messiahship. Now consider, please, the tremendous import — the overwhelming significance — of Jesus' statement. Think what this means! Jesus staked His claim to being your Saviour and mine upon remaining exactly three days and three nights in the tomb. If He remained just three days and three nights inside the earth, He would prove Himself the Saviour — if He failed in this sign, He must be rejected as an impostor! Jesus, they say, was placed in the tomb shortly before sunset Friday, and rose at sunrise Sunday morning — two nights and one day. Even these same higher critics admit that in the Hebrew language, in which the book of Jonah was written, the expression "three days and three nights" means a period of 72 hours — three twelve-hour days and three twelve-hour nights. In Genesis 1:4 God "divided the light from darkness. And God called the light Day, and the darkness he called Night. And the evening [darkness] and the morning [light] were the first day .... And the evening [darkness] and the morning [light] were the second day .... And the evening [now three periods of darkness called night — three nights] and the morning [now three periods of light called day — three days] were the third day" (Gen. 1:4-13). Here we have the only Bible definition which explains and counts up the amount of time involved in the expression "the third day." It includes three dark periods called "night," and three light periods called "day" — three days and three nights, and Jesus said they contained twelve hours for each period — a total of 72 hours. The simple answer is, they do not know it — for it is not true! It is merely tradition, a tradition we have been taught from childhood and carelessly assumed! Jesus warns against "making the word of God of none effect through your tradition" (Mark 7:13). Examine this text carefully. You cannot, by any process of arithmetic, figure any less than a full 72 hours — three days and three nights — in a resurrection which occurred three days after the crucifixion. If Jesus was in the grave only from Friday sunset to Sunday sunrise, then this text too, must be torn out of your Bible or else you must reject Jesus Christ as an impostor! If He rose after three days, it might have been more than 72 hours, but it could not have been a second less. If we are to accept all the testimony of the Bible, we must conclude that Jesus was exactly three days and three nights — three full 24-hour days — 72 hours in the grave, or the only supernatural proof He gave must fail. Now notice carefully this fact: In order to be three days and three nights — exactly 72 hours — in the tomb, our Lord had to be resurrected at exactly the same time of day that His body was buried in the tomb. Yet Jesus was buried before this same day ended — before sunset (Matt. 27:57; Luke 23:52-54; John 19:42). 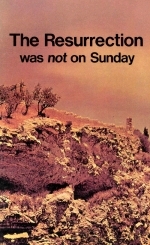 John adds, "There laid they Jesus therefore because of the Jews' preparation day." According to the laws observed by the Jews all dead bodies must be buried before the beginning of a Sabbath or feast day. Hence Jesus was buried before sunset on the same day He died. He died shortly after 3 p.m. Therefore — notice carefully — the burial of Christ's body was in the late afternoon! It was between 3 p.m. and sunset as these scriptures prove. Just what is a "high day"? Ask any Jew! He will tell you it is one of the annual holy days, or feast days The Israelites observed seven of these every year — every one called a Sabbath! Annual Sabbaths fall on certain annual calendar dates, and on different days of the week in different years, just like the Roman holidays now observed. These Sabbaths might fall on Monday, on Thursday, or on Sunday. Jesus was slain on the very same day the Passover had been slain every year. He was crucified on the 14th of Abib, the first Hebrew month of the year. And this day, the Passover, was the day before — and the preparation for — the Feast day, or annual high day Sabbath, which occurred on the 15th of Abib. This Sabbath might occur on any day of the week. Frequently it occurs, and is observed even today, on Thursday. For instance, this "high-day" Sabbath came on Thursday in 1972, 1975 and 1979, and will occur on Thursday in 1982, 1986 and 1989. The first investigators, Mary Magdalene and her companions, came to the sepulcher on the first day of the week (Sunday) very early, while it was yet dark, as the sun was beginning to rise, at dawn (Mark 16:2; Luke 24:1; John 20: 1). Now all this is based on the supposition that Jesus did fulfill His only sign of being three days and three nights in the grave. All our evidence is based on the claims of Jesus before His crucifixion. But some of the higher critics and doctors of divinity tell us that Jesus made a mistake — that He was only in the tomb half as long as He expected to be. Let us have proof as to whether He did spend the exact amount of time in the grave He said He would. Notice that in Matthew 28:6, the angel of the Lord gives this testimony, which we now present as evidence. "He is not here: for he is risen, as he said." And He certainly did not rise AS He said unless He rose at the precise TIME that He had said! So we have the proof of the angel of the Lord, recorded in the sacred Word of God that Jesus did fulfill His sign — He was three days and three nights in the earth — He did rise Sabbath afternoon, and not on Sunday morning. His death and burial were according to the Scriptures — not contrary to them. Jesus was crucified on Wednesday, the middle day of the week. He died shortly after 3 p.m. that afternoon; was buried before sunset Wednesday evening. Now count the three days and three nights. His body was Wednesday, Thursday and Friday nights in the grave — three nights. It also was there through the daylight part of Thursday, Friday and Saturday — three days. He rose Saturday the Sabbath — late afternoon, shortly before sunset, at the same time of day that He was buried! Another passage that might confuse is Luke 24:21: "... And beside all this, today is the third day since these things were done." "These things" included all the events pertaining to the resurrection — the seizing of Jesus, delivering Him to be tried, the actual crucifixion, and, finally, the setting of the seal and the watch over the tomb the following day, or Thursday. Study verses 18-20, telling of "these things" and also Matthew 27:62-66. "These things" were not completed until the watch was set, Thursday. And the text says Sunday was the third day since these things were done. Sunday truly was the third day since Thursday. But it was not the third day since Friday, so this text could not prove a Friday crucifixion. Turn to Matthew 28:1. In the common versions it says, "In the end of the Sabbath," or more correctly, "after the Sabbath." Notice that both of these renderings use the singular — Sabbath. But in the original Greek the word is in the plural. Fenton renders it correctly by saying, "After the SABBATHS," although the remaining part of the verse he has not translated quite correctly. In a footnote to this text, he says, "The Greek original is in the plural, 'Sabbaths.'" There is only one possible explanation: After the annual high-day Sabbath, the feast day of the days of Unleavened Bread — which was Thursday — these women purchased and prepared their spices on Friday, and then they rested on the weekly Sabbath, Saturday, according to the commandment (Ex. 20:8-11).